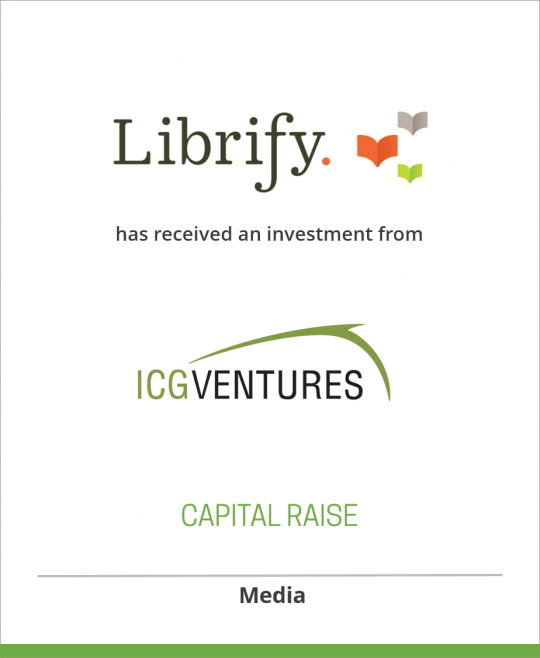 Librify, Inc. has received an investment from ICG Ventures, Inc.
DeSilva+Phillips, announces that its client, Librify, Inc., has received an investment from ICG Ventures, Inc, an Ingram Content Group company. Librify provides publishers with an important new retail channel and direct ways to interact with consumers. The Ingram investment will allow Librify to enhance its offering as it prepares for its broad market launch later this Spring. The timing of the investment announcement coincides with both Ingram and Librify speaking on panels at the Digital Book World 2014 conference. John R. Ingram will be joining Librify’s Advisory Board which includes Brian Napack, Senior Advisor at Providence Equity; Dominique Raccah, CEO and Publisher of Sourcebooks; Robin Warner, Managing Director at DeSilva+Phillips; and Andrew S. Rosen, Chairman and CEO of Kaplan. Coincidentally, Stone met Roland for the first time in person at last year’s Digital Book World conference. Librify is a retail and subscription service providing the first comprehensive eBook platform for book clubs. Based in New York City, Librify was founded in February 2013 by a team with extensive publishing industry experience and a successful track record of launching new businesses. Librify will offer social reading and other features to enhance the book club experience with a book-of- the-month-club–style subscription service. For more information, visit www.librify.com or contact press@librify.com. Investment from ICG Ventures, Inc.